There has been a noteworthy increase in the magnitude of technological advancements in the fields of medicine, academics, architecture and other verticals. 3D printing has played the role of a capeless hero in many cases. 3D printing technology has given many small-to-medium businesses, or SMBs, the opportunity to prototype quicker and better at an affordable cost, in better and optimal packaging, with ease of small volume production. We are Divide By Zero, an industrial-grade 3D printer manufacturing company. Divide By Zero has played a pivotal role in helping SMBs exploit 3D printing solutions to the fullest, thereby contributing to the industrial revolution in our own way. Our client, Mr. Bharat Joshi’s Yantracraft, is a one-man design consultancy aimed at exhibition and product display design. Mr. Joshi aspires to have a full-blown design consultancy and a fabrication lab or a fab lab in the next 2 years. Mr. Bharat Joshi says, “As a part of this goal, the Accucraft i250D 3D printer has been a boon.” Like many others, Mr. Joshi made a smart choice. He adapted to more efficient methods of modelling in order to attain an accurate model in a favourable span of time. Last year in 2016, Yantracraft was co-commissioned by the Government of Punjab to create a scale model of the legendary Golden Temple. This includes the entire complex, including the holy shrine. 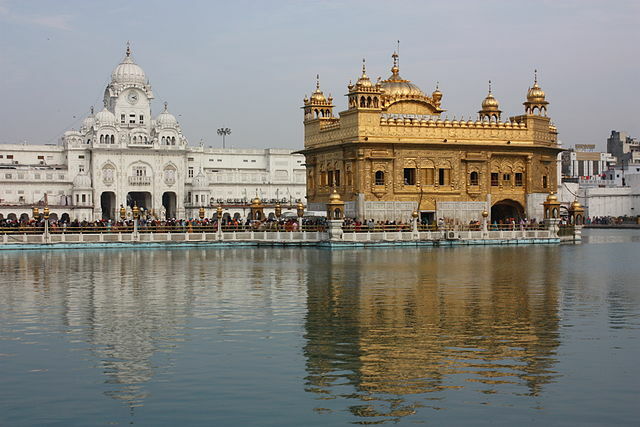 The Golden Temple is the holiest Gurudwara in Sikhism, located in Amristar, India. This shrine, also known as Sri Harmandir Sahib, covers total area of 8.2m X 8.2m, with exquisite and intricate gold relief work on the pillars and roof. Yantracraft were expected to make a model of the temple to the scale of 1:20. This translated into a model with dimensions 8mX8m. The project required them to submit the model under strict and tight time constraints. If that wasn’t enough, the Golden Temple has some intricate gold relief work, which is very difficult to replicate accurately, especially given the time constraints. The conventional methods would require for Yantracraft to physically measure every part of the main Golden Temple. After this, the model would undergo manual cutting for design accuracy and precision of the size and scale. 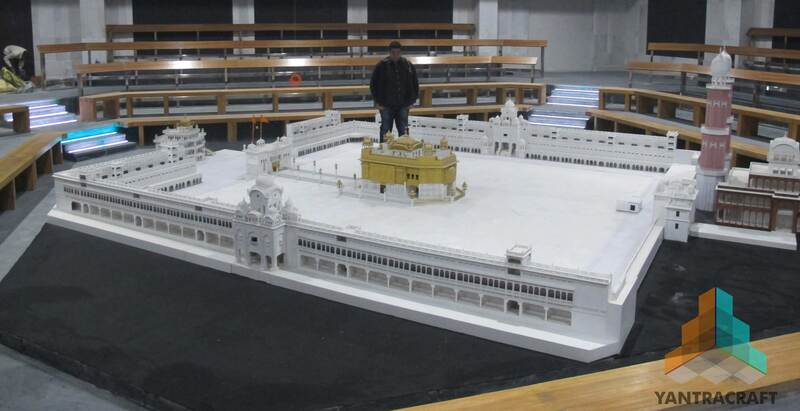 The model would’ve had to undergo numerous iterations to match the scale to the actual golden Temple. The colossal damage in this process would be a huge waste of material, along with the obvious stretched timelines. 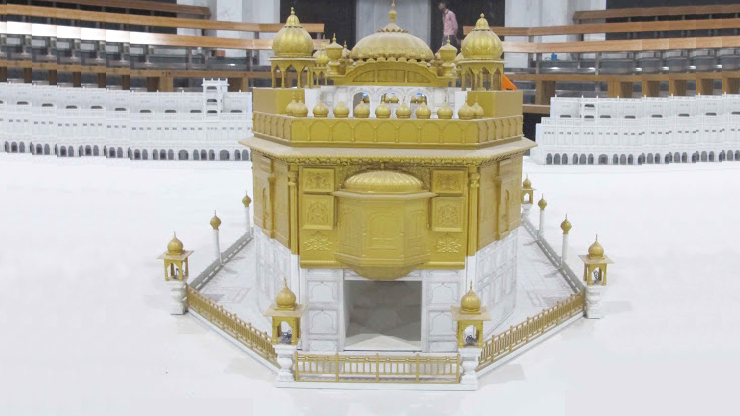 As the Golden Temple is an extremely sacred shrine and involves the sentiment of the Sikh sect, and the model had to depict all of it, it was very important for the model to be as accurate as possible. As conventional methods were obsolete in this case, Yantracraft turned to Divide By Zero’s 3D printers and started considering 3D printing as a viable alternative solution. 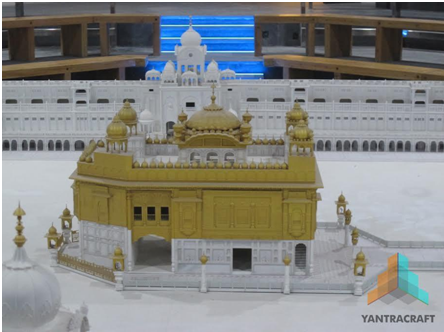 Yantracraft opted to use the industrial grade 3D printer Accucraft i250D for building the model of the Golden Temple. Accucraft i250D is equipped with quick-load functionality, super-fast slicer and industrial-grade build quality that ensure fast and reliable print-cycles. The entire Golden Temple complex was 3D scanned. You can visit our gallery to see more images of the scaled model. If this interested you, read about the interesting applications of the 3D printing technology from our other SMB clients well in our Clients Speak series. Get our hands on our white papers as well, right here.